I was up with the sparrows this morning so I could get some work in early and then play a quick game of tennis. I often intend to play tennis on a Friday morning but have only managed it once in the last year. As I focus more now on increasing exercise, I was determined to go. By working from 6 – 9 am, I didn’t feel bad about popping out to play tennis for an hour. 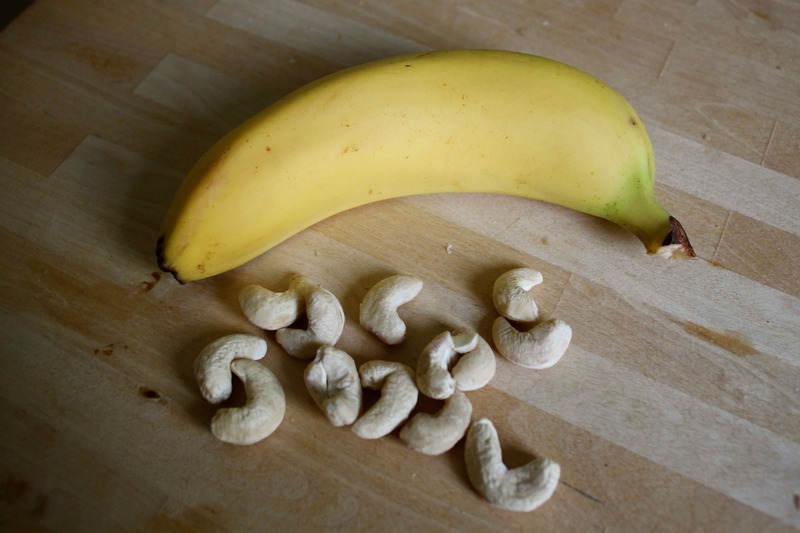 I had a small snack of a banana and a few cashew nuts to give me energy. I thought I was playing doubles but it ended up as singles which I have avoided for ages as I don’t feel fit enough but actually it was OK and I really enjoyed running around. Thanks for the game Emy. I wanted another breakfast pudding but this just did not work out well. 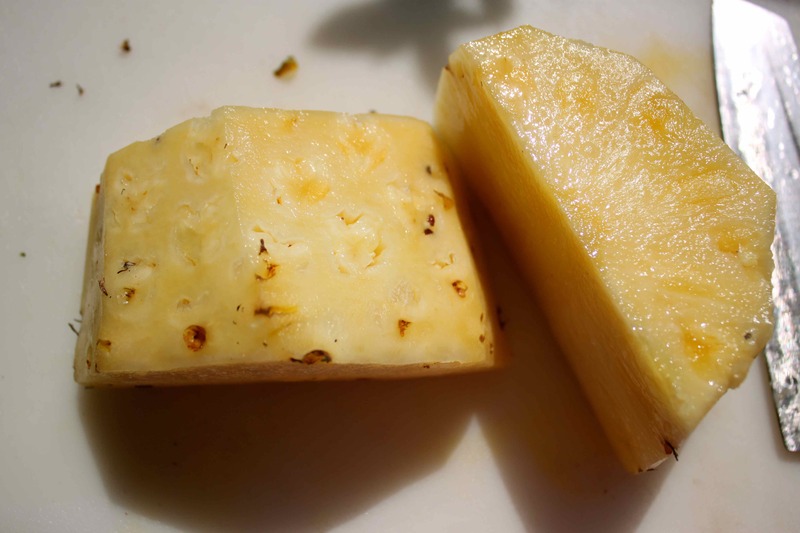 The pineapple was perfectly ripe, sweet and juicy so that should have been fine. 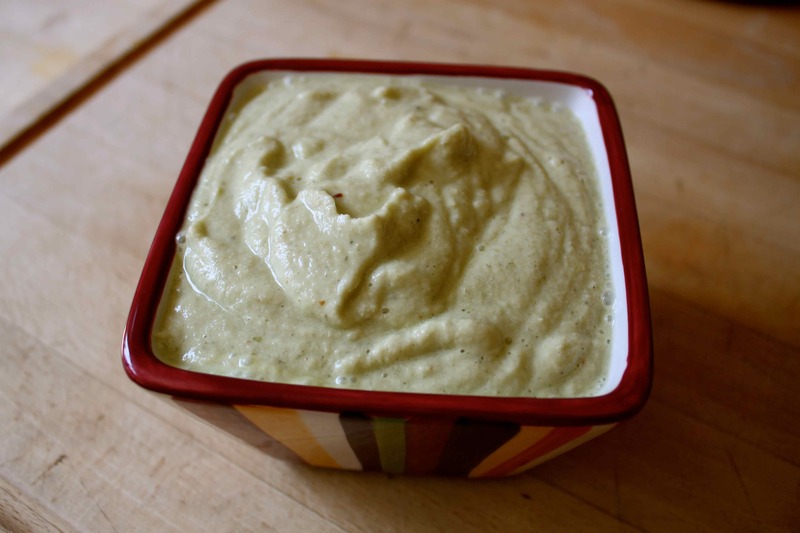 I had soaked 1/4 cup sunflower seeds and 1/4 cup pumpkin seeds overnight and I blended it all together. It was rather tasteless. Bland. Uninspiring. So I stirred in some Lucuma, Maca, Kelp and Spirulina. They didn’t improve the flavour but did boost the nutritional value I am quite stressy at the moment and was craving chocolate so I made a chocolate shake for lunch. 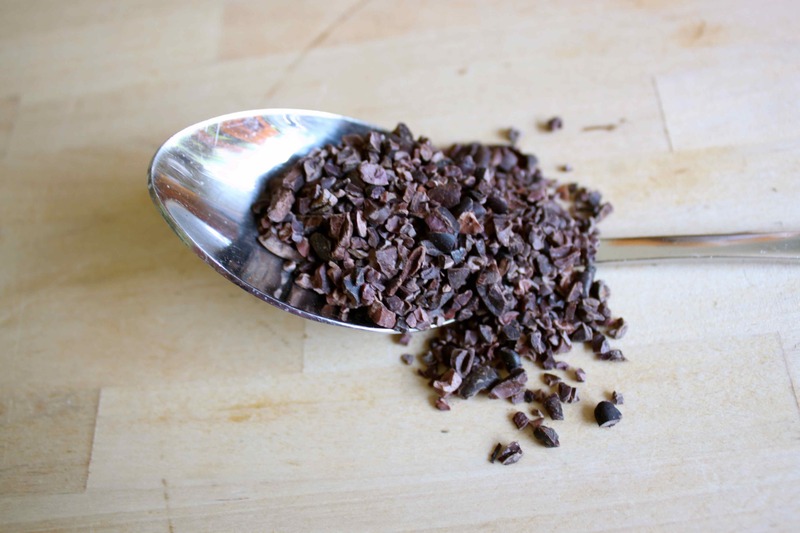 If you want chocolate, have healthy chocolate. 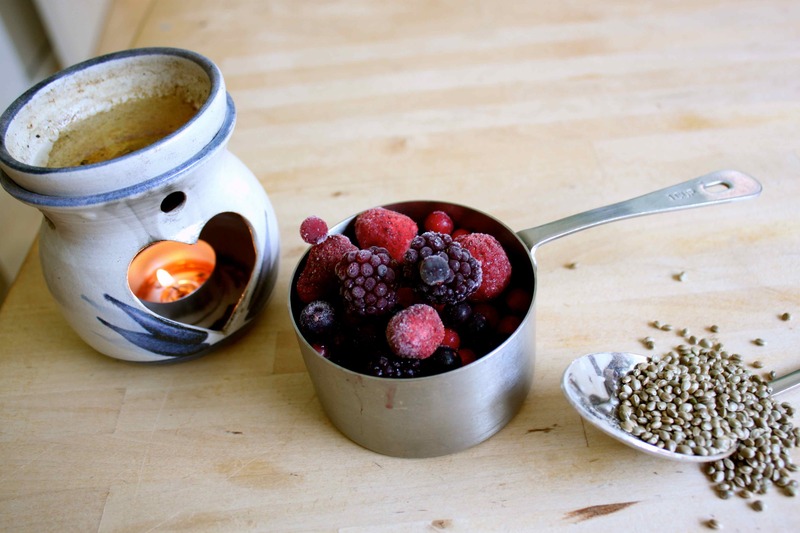 I ground up 1 tbsp cacao nibs in a coffee grinder with 1 tbsp hemp seeds. 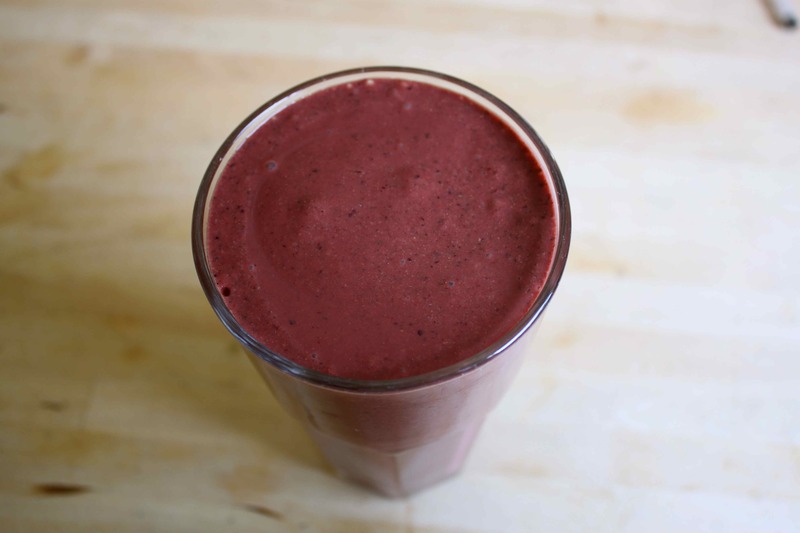 I added a cup of mixed berries for a berry boost. I didn’t eat the candle obviously. I was burning Patchouli oil. I love its strong and earthy aroma and apparently it helps relieve tension and uplift your mood. 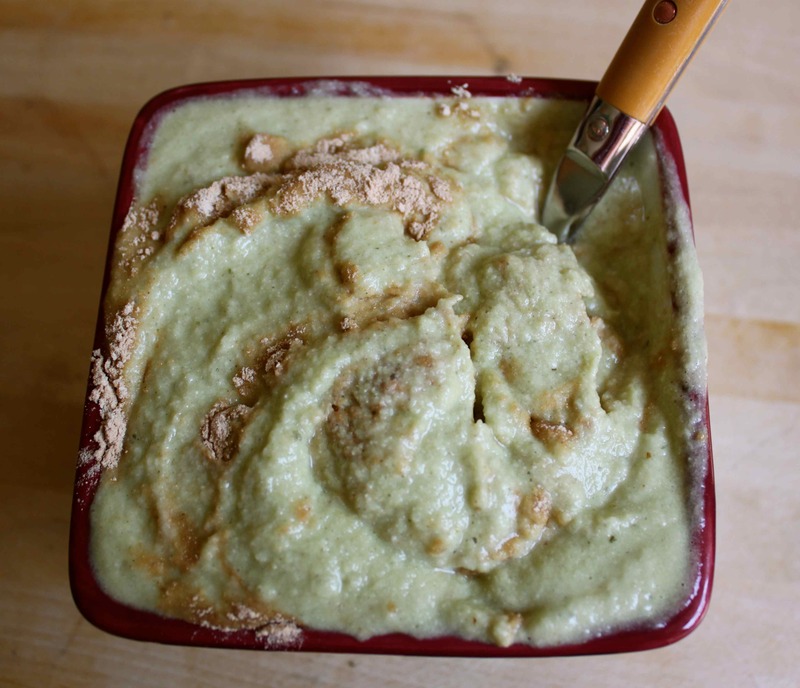 I also added some Lucuma, Maca and Carob. This was good. Not as chocolatey as I wanted but it filled me up until diner time. I finished work at 7, hopped in the shower and we headed up the road to my lovely neighbours, Marion and Colin’s. Oh look, there are some of my favourite neighbours. Let the good times roll. I do confess I drank too much but not a ridiculous amount. I started eating only the healthy food Marion had prepared. 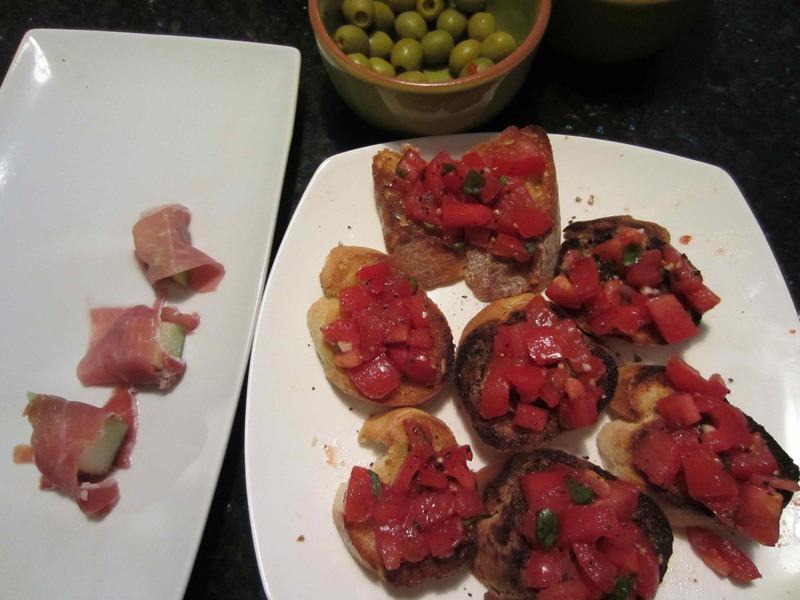 Parma ham and melon, olives and bruschetta. Yummy. But then the wine took over so I had some crisps too. Our main course was a gorgeous chicken dish in a rich and slightly sweet sauce. 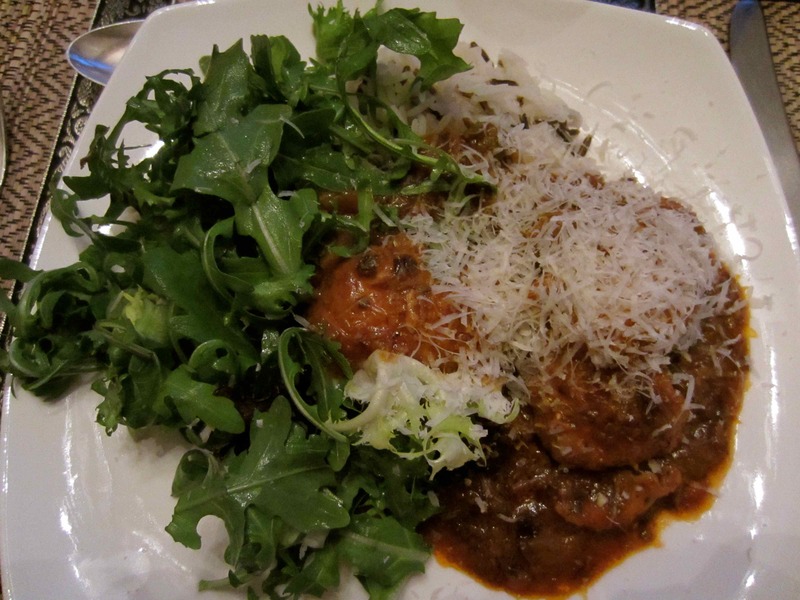 Served with rice, green salad and grated Parmesan on top. Really good. Ta Daaaa ! 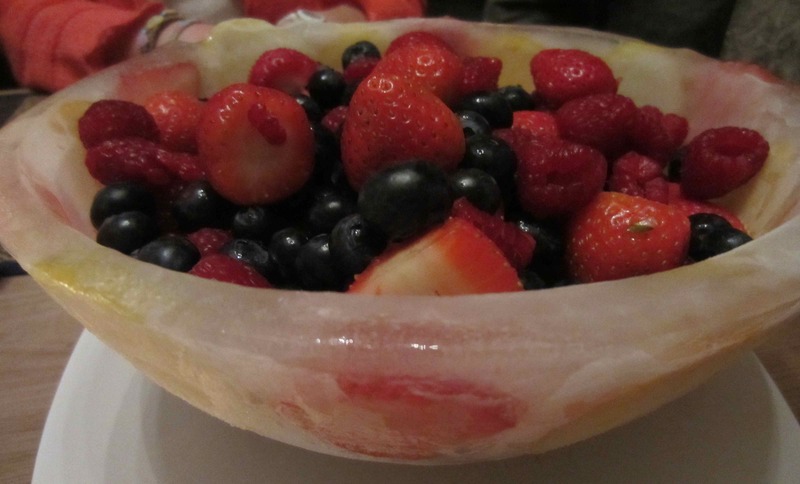 A spectacular ice bowl, with slices of fruit within the ice and filled with berries. 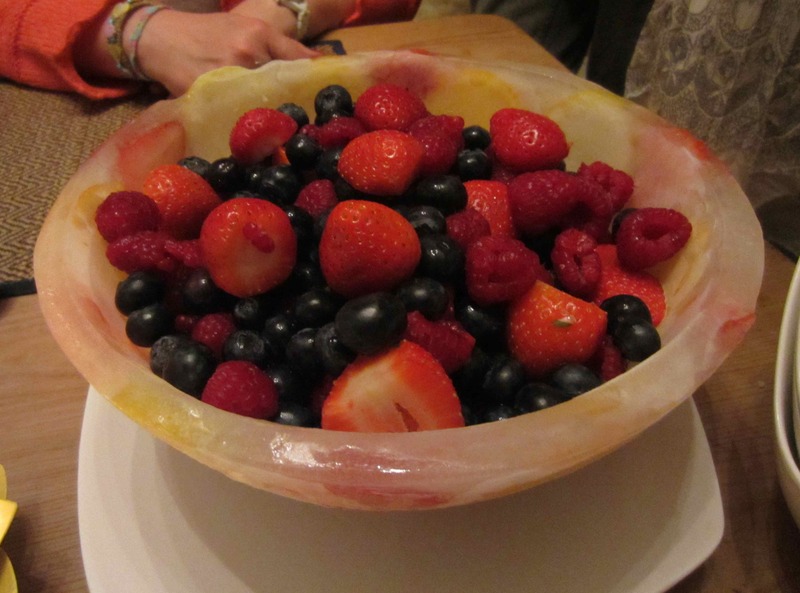 Such a beautiful way to serve a bowl of fruit. 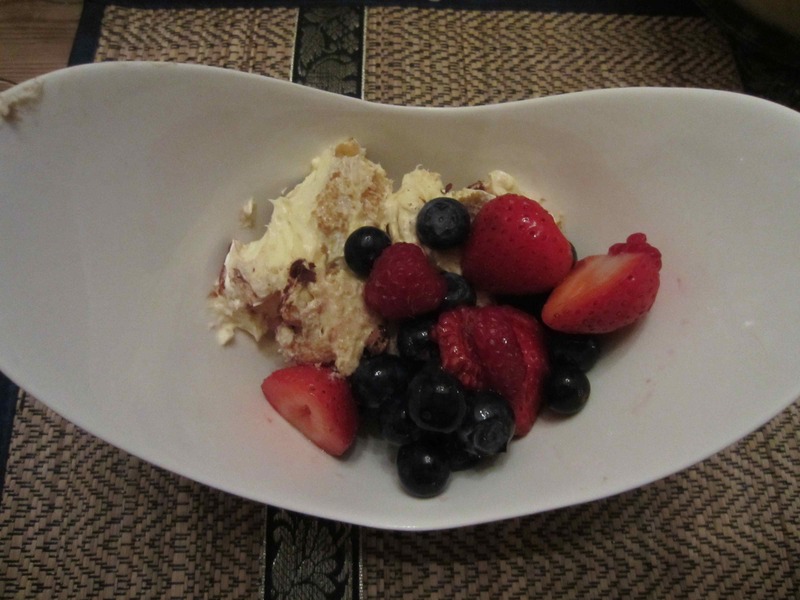 Marion had also made a Tiramisu which was heavenly. Too heavenly actually so I had 2 servings. It always reminds me of my sister Abi who made it regularly after living in Italy. It was really good. There was then some chocolate consumption and a bit more wine. Not too much so I feel fine the morning after. 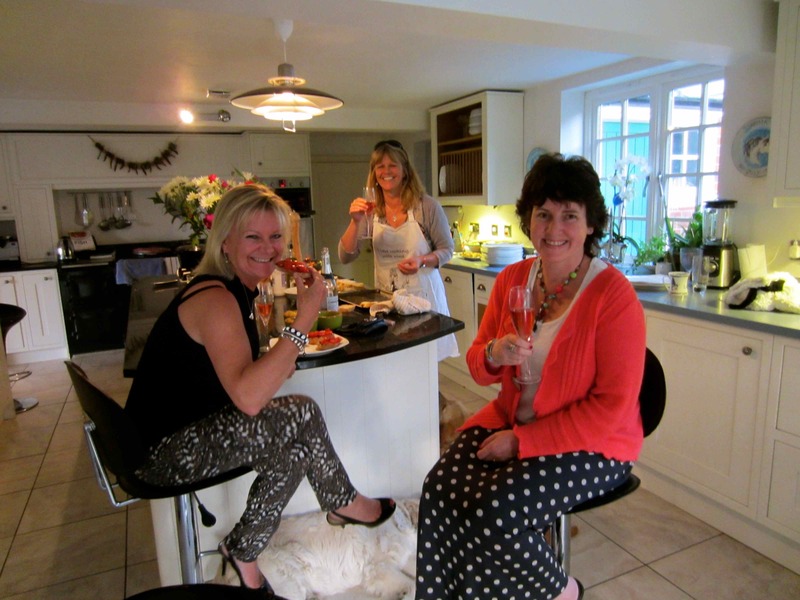 It was a really lovely evening, with great food and a beautiful home to sit in. But the best part, as always, was the wonderful company. I went to bed a happy and much more relaxed person than the one who had woken up that morning. This entry was posted in Uncategorized and tagged Pineapple. Bookmark the permalink.